The Aviation Maintenance Technical Engineer (AMTE) program takes the student through the basics of flight and into the latest technological advances for the world of aviation. Career opportunities are opened wide for the graduate of the Aviation Maintenance Technical Engineer program. 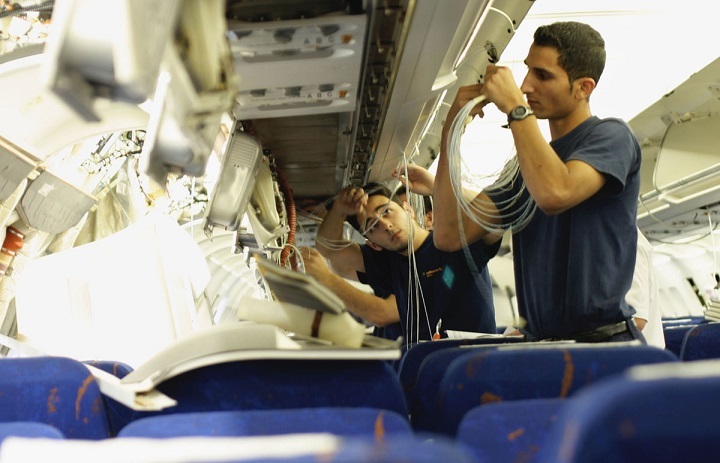 The course of study takes the student through the hands-on techniques and knowledge in such areas as composite fabrication and repair, sheet metal, hydraulics, pneumatics, instrumentation, landing gear, and piston and turbine engines, to include the various aircraft systems. The student learns the intricacies of the entire aircraft as each system is dissected for deeper understanding. The students will gain the skills to properly and efficiently troubleshoot and repair aircraft systems as they relate to fixed-wing aircraft and rotary aircraft. This program blends aircraft electrical systems into more advanced aircraft electronics (avionics) that will enable the student to implement the "keep it simple" approach to troubleshooting. Students will prepare to take the Federal Communications Commission (FCC) test for their Element One and Element Three License, or the GROL (The General Radiotelephone Operators License), as well as the coveted FAA Airframe and Powerplant License. The Aviation Maintenance Technical Engineer graduate will receive the entry-level skills required to maintain and repair aircraft engine systems, airframes, and avionics systems, enabling the graduate to be successful in the ever-expanding field of aviation. This training prepares the student with the proper knowledge and skill levels required to pass the tests administered by the Federal Aviation Administration (FAA) and the Federal Communications Commission (FCC) to gain entry-level employment in exciting careers as an A&P Mechanic, Aviation Maintenance Technician, Avionics Technician, Inspectors, Installers, Parts Managers, or Service Technicians. The graduate will find these career opportunities throughout the U.S. and the world in the areas of aircraft manufacturing; charter, corporate, or commercial airlines; the U.S. Government; or in the ever-growing general aviation sector. Positions with the regional and major airlines often include good wages, comprehensive benefits for the graduate and family, and complimentary free travel. The more recognizable career opportunities are in regional air carriers, general aviation, manufacturers, industrial trades, and the U.S. government. The student will be able to service, repair, and overhaul aircraft components and systems, including the airframe, piston engines, turbine engines, electrical systems, avionics systems, hydraulic systems, propellers, instrumentation, warning, and environmental systems. *Program details may vary by campus.